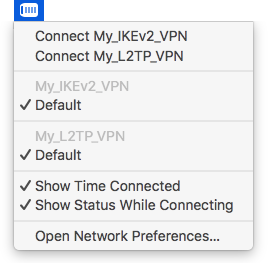 macOS 10.13 contains a built-in VPN client that natively supports L2TP over IPSec as well as IKEv2. 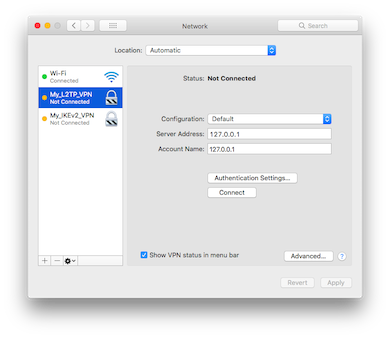 In this post I describe some parts of the internal architecture of the macOS VPN client. This information will be used in a following article to build an application that replicates some functionalities of the VPN status in the menu bar. 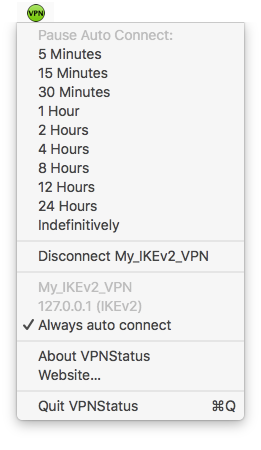 This application will also allow to auto connect to an IKEv2 VPN service, something that is currently not possible on macOS. For Apple employees reading this blog post, you can find my bug report 41950946: scutil doesn't support IKEv2 VPN services here: rdar://41950946. Please note that I describe undocumented internal APIs of macOS 10.13.5. Apple could change the implementation at any time. The notes below could become outdated and I give no guarantee that it is completely accurate. However this command line tool is not working with IKEv2 VPN services. The VPN Status is implemented as a Menu Extras, a private API unrelated the public NSStatusItem API. It is loaded by the SystemUIServer process and its binary is located at the path /System/Library/CoreServices/Menu Extras/VPN.menu. While the VPN Status app seems like a smaller target than the System Preferences application, I decided instead to analyze how the Network prefpane works. The main reason is that attaching a debugger to the Network prefpane is easier than attaching a debugger to the SystemUIServer process. The architecture of the System Preferences application is more complex. This application loads preference panes created using the public PreferencePanes framework /System/Library/Frameworks/PreferencePanes.framework. 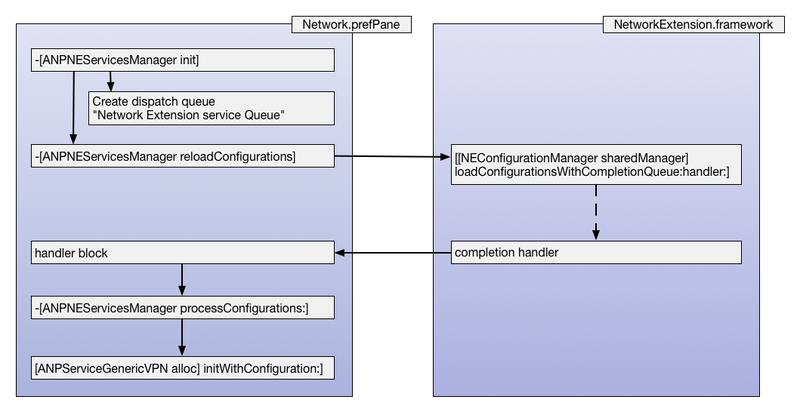 This plugin architecture is well described in Apple’s documentation Architecture of Preference Panes. The plugin responsible for the Network preference pane is Network.prefPane. 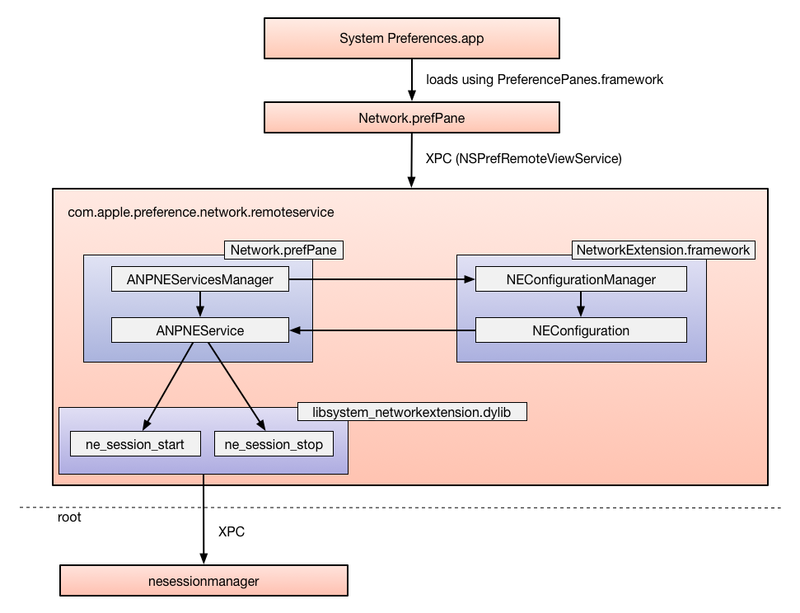 The Network preference pane represents the different services it supports using the Objective-C class ANPTopLevelService. In our case we are really only interested by the ANPNEService subclass. Below is a stripped down interface for the ANPNEService class. Note that an instance is created using a NEConfiguration object (more about it later) and it has a ne_session_t (more about it later). Also note the methods -connect and -disconnect. Note that the NetworkExtension.framework (/System/Library/Frameworks/NetworkExtension.framework) is a public framework. However the NEConfigurationManager and NEConfiguration classes are private classes within this public framework. 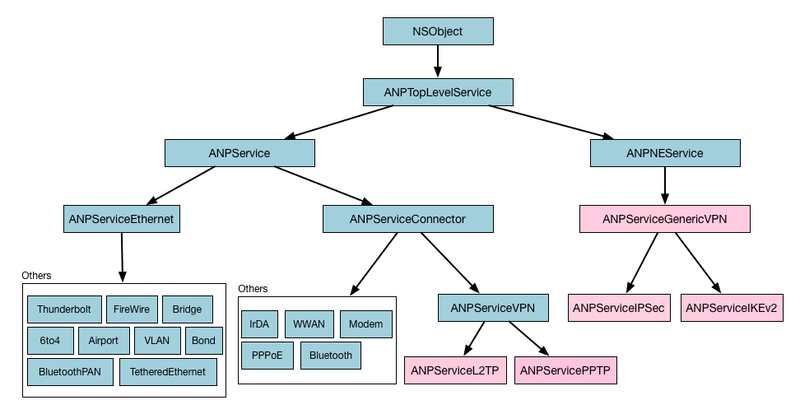 I previously mentioned that each ANPNEService instance owns a ne_session_t. Let’s look at this. Timac:~ timac$ nm /usr/lib/system/libsystem_networkextension.dylib | grep "T _ne_session_"
Finding the correct prototypes for these functions was simplified thanks to the open source file SCNetworkConnection.c. If you look at the implementation of the ne_session_* functions, you will note that these functions are sending their request through XPC to the root dameon nesessionmanager located at the path /usr/libexec/nesessionmanager. cstr_00072C74   "%.30s:%-4d %@: Ignore restart command from %@, a pending start command already exists"
cstr_00072CCA   "%.30s:%-4d %@: Stop current session as requested by an overriding restart command from %@"
cstr_00072D7D   "%.30s:%-4d %@: Received a start command from %@, but start was rejected"
cstr_00072DFD   "%.30s:%-4d %@: Received a start command from %@"
cstr_00072E2D   "%.30s:%-4d %@: Skip a %sstart command from %@: session in state %s"
cstr_00072E73   "%.30s:%-4d %@: Received a stop command from %@ with reason %d"
cstr_00072F7E   "%.30s:%-4d %@: Received an enable on demand command from %@"
For example when an IKEv2 service is started, the method -(void)[NESMIKEv2VPNSession createConnectParametersWithStartMessage:] will be called. The architecture of the daemon is out of the scope of this article.